Mosasaurus, now extinct, were carnivorous, aquatic lizards, somewhat resembling crocodiles with hydrofoil-like flippers, and they had elongated heavy jaws. The genus existed during the Cretaceous period, around 70 million years ago. Experts believe that Mosasaurus lived near the ocean surface, where it preyed on fish, turtles, ammonites, and possibly small mosasaurs. Although it was able to dive, it evidently did not venture into deeper waters. 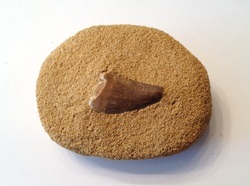 The fossil tooth specimen owned is identified as Mosasaurus anceps, and is noted as having been collected in Khouribga, Morocco. It is slightly over an inch in length, and it appears that the root was broken and separated from the tooth. It is in a sandstone matrix that is approximately 2 ¾” x 2”.